Elizabeth Spires is an important American poet, a student of Zen Buddhism, whose haunting work is filled with a mix of active spiritualism intersecting with meditational silences. 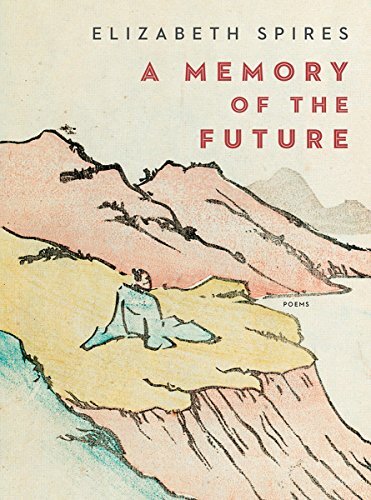 A Memory of the Future is her seventh poetry collection. In these lyrical verses, Spires questions the quotidian, elevating the everyday to a meditational art form. Despite the question, Spires has a destination and a goal: the placement of words on the page. Spires is, of course, the poet, the purveyor of words, working through the smoky darknesses created by that hand above her, darknesses ink forgets and light remembers. In the poem, “Zen Sonnet,” Spires writes, “So let us go out into the world and wander a little/,” continuing her thematic of no particular destination (but, of course, the page). In the poem, “The Road,” Spires arrives at a place where the random song of a night bird “. . . sounds/like Keats . . .” and that is where she stops for the evening, drawn by the poetry. When she sets out again in the morning, she encounters “a few souls, gray as time,/” and retraces her steps backward, the journey at once old and young, circuitous and temporary. Eternal. In this way, Spires meanders, saunters, and seems to wander incidentally to and from places of inspiration where distinctive elements of her poetry emerge, especially as she retraces the journeys of her time. In the final analysis, she remembers, and in her resultant poetry, the power of her observations make these journeys tangible and real to the reader. Spires outlines acts of appreciation for the material world, acts of holding on, and acts of futility. It is this close attention that marks Spires’ poetry, that sets it apart. In a collection focusing on aesthetic abstracts, it is to Spires’ credit as a poet that she is successful most of the time in maintaining a complementary connection with carefully observed detail. The ekphrastic piece, “Mountains of the Heart,” based on the artist’s book drawn by Kameda Bōsai in 1816, is an excellent example of close visual interpretation as Spires observes and trans-personalizes, objectifies, and re-symbolizes Bōsai’s images. She outlines Bōsai’s struggles with his art, as he reproduces specific landscapes and focuses on unpredictability. “One season bleeds into another . . .” writes Spires in “Light Like Water.” Light, like destination and lack of destination, is akin to a religious force in much of her work, light and its concomitant darkness. Her simile of “light like water” suggests light flowing out to the sea, forming great riverine estuaries of illumination. Children die in these poems, and are buried where hyacinths bloom, presumably in open light. And March comes to Manhattan with a Lent that is dark and gray at St. John the Divine. Church-goers pray by guttering candlelight in a city otherwise obsessed by the light from cell phones, tablets, and laptops. “In darkness,” writes Spires in the poem, “Small as a Seed,” “light not yet apprehended . . . ,” the light in this case present but neither fully understood nor completely recognized. The other side of darkness is always light. Even when the light is invisible. In the ekphrastic poem, “She Leans,” Spires addresses a photograph by A. Aubrey Bodine of an unlikely house, narrow, deserted, swaying into an unrecognizable horizon, the exterior of the house swaddled in light, the interior leaking an elemental freight of darkness, the same darkness that encompasses Spires’ “Island Graveyard” in the poem by that name, a darkness that indicates sun will eventually break through, but not until the poet feels an inchworm on her arm, measuring her for “new” clothes, as if outfitting us all for the final destination. The poet journeys without destination save the poetry that defines the journey itself. She ontologizes the warp and weft of darkness alternating with light, life interweaving with death, dreams weaving through trance and sleep, wakefulness rousing to re-dissolve into musing. The wide water and the earth that contains it issue a siren’s call, a kind of spiritual beckoning, the wandering having become cyclical, like the life cycle of the cicadas—endlessly repeating—drawing us upward to the light of the sun, then downward to the loamy gravitational pull of the earth or into the undertow of the waters. By nature of Spires’ aesthetics alone, this work fulfills us, deepening the mystery of our darknesses, our light, our silences, our rejoicings. These poems glow with interiority—profound, intense, spiritual.